In school auditoriums, church basements and parish halls across the country, young children and their parents aren't focused on their phones and tablets, they are watching small wooden cars with simple plastic wheels race down a track for glory, perhaps a trophy and most definitely a patch. Several years ago I took a Scoutmaster/Assistant Scoutmaster specific training course that my district was holding, it was required for SMs and ASMs. Even though I had been an adult leader for seventeen years and my years being an assistant scoutmaster or scoutmaster were behind me, I thought it might recharge my battery for scouting. During one of the sessions when we were discussing the methods of scouting a lively debate started when the subject of advancement came up. 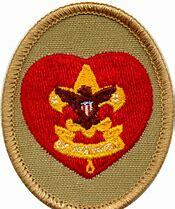 There were many leaders who really believed that it was their job to make sure that their scouts become Eagle Scouts. One leader, who like me was a long time scouters and was only taking the course because he wanted to remain “trained” said that he would hate for any of his scouts to be “Life for Life”. I stood there on the side of a rocky camp road, in between a dentist and a real estate agent. We were just three of the 48 men and women standing in a silent line. Then there was a horn blast in the distance. And we started filing into a small field (I believe it was an archery range at one point) with a rustic wooden sign that said Gilwell. As we filled in, followed our den chiefs and formed 3/4 of a perfect square, with the senior staff of Wood Badge course n2-388-14 making the final side. While all us participants were eager and excited, we took a cue from the staff that this was a place of reverence. The fun of wood badge would be mostly past the little trail that led into Gilwell Field. Boys will be boys. Girls will be girls. And they'll all be Cub Scouts. I was standing in the lobby of the Greater New York Council of the Boy Scouts of America with a member of my troop and Pack committee when my phone dinged. Being obsessed with my phone I took it out of my pocket. And then I saw the CNN alert that changed everything. The BSA would be admitting girls into the Cub Scouts in 2018 and announcing a plan to allow girls a path to earning the Eagle rank in 2019. Wow. This was a game changer. The office was almost immediately a buzz. Everyone had just about the same info I just received.